Maybe it’s the footwork training he did for Creed II, but our best-dressed man of 2018, Michael B. Jordan, rarely makes a style misstep. Every move is a simple one-two, a defensive pair of black jeans followed by an uppercut of a sweater. A knock-out double-breasted suit grounded by a crisp white shirt underneath. You could argue that he’s a safe choice. In a year of stunting scumbros and a smirking Jeff Goldblum, Jordan is certainly less flamboyant and less trend-obsessed. But if you think his style is pedestrian, you’re not looking closely enough. This is a man who ducks and weaves around the craziest fashion trends, only sparring with the ones that count. He’ll take on statement trend pieces like streetwear-tinged knits or grunge-influenced outerwear, but he’ll wear them in a rotation that also includes a classic overcoat, some Chelsea boots or some trusty Wayfarers. The staples that have served him (and all men) well for years. For the average guy wondering how to balance flash-in-the-pan fashion with everlasting style, Michael B. Jordan is a walking masterpiece. He sticks to the rules of menswear but throws in touches of his own so that he never looks like another Instagram drone. Here we deconstruct the Michael B. Jordan look, with seven staples that will look great on any guy. Not all heroes wear capes. The Black Panther star’s own secret weapon is a trusty arsenal of punchy sweaters with eye-catching prints. (No wonder they like him over at Coach.) The pattern draws attention to his ring-ready upper body while the silhouette hugs rather than squeezes Jordan’s frame. The dimensions are always spot on – hemmed at the waist with sleeves reaching the wrist. Why go oversized when regular fits work this well? And don’t try and fight the statement sweater. Jordan rarely wears an overcoat over his, while the bottom half balances out the colour and pattern with a pair of slim black jeans and Chelsea boots. One big difference between American tailoring and that in the UK is in the shoulders. 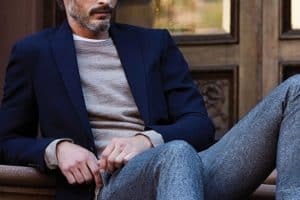 Us Brits are big padders, the yanks less so, their tailoring more likely to follow the Italian tradition of less is more when it comes to structure. This suits well-built men like Jordan. The rounded, sloping shoulders keep his upper body in proportion and prevent him from looking like a Lego man, even when he’s in black tie. He’ll also play with tradition by incorporating some unexpected accessories, or by picking up a defiantly different suit, like this rogue pinstripe number. Plaid is the perfect pattern for streetwear-inspired looks. It’s eye-catching, just like the best Instagram-popping street style, but it’s also extremely casual with a tradition in grunge and outdoorsy American workwear. Streetwear in itself is meant to be an attack against the buttoned-up culture that still remains in the other half of menswear so in this respect, it works well. In general, plaid is pretty low risk. Wear loose like Jordan though and with a dark, simple outfit underneath so nothing is fighting against those checks. The double-breasted suit is very much back in fashion, owing to a resurgent interest in 80s boxy tailoring. It’s a mighty thing. Six buttons usually, eight if you’re really pushing the boat out, rising up in unison to a peak lapel that gives you a V-shaped upper body whether you’re built like a boxer or not. Jordan wears his more buttoned-up than the current catwalk waifs. The lapels are short and tight keeping the look elegant and restrained while pleated trousers give the outfit some welcome flair. Then comes a sprinkle of panache in a pair of heavily decorated loafers or shiny gold buttons so it’s not too Wall Street stiff. It’s a winter staple that can turn you into a heart-throb overnight (just ask Benedict Cumberbatch) but classic doesn’t have to mean boring. Jordan knows that his top layer is the one everyone will see first so he goes for an eye-catching one. Contrast collars, checks, rich tonal palettes are all in the mix and he’ll also wear them down to the knees for extra impact (and insulation, presumably). An old-school military fit will outline your proportions and a strong, angular lapel gives a flattering silhouette through the body. There’s a good case for making your overcoat the biggest investment in your wardrobe. Clothes are not meant to encase your body like sausage meat in casing. Sure, it’s a menswear basic but it’s one so many guys often get so wrong, especially in the trouser department. Jordan has a liking for slim fitting black jeans, using them to great effect in balancing out a colourful top-half, but they never shrink-wrap towards the skinny side. If you pinch the side of your jeans you want to grab a fingertip of fabric. This is how you’ll know they are neither too baggy nor too tight. Once you have the perfect jean down it makes sense to buy four or five of the same pair to use in an easy rotation. If there are still any contenders left in the ring for Jordan’s best-dressed crown then they had better prepare themselves for the champ’s knockout punch, the bomber jacket. This menswear classic is flattering for all types, but especially the gym bunnies, with the cinch at the waist only serving to highlight the bulk. Dark neutral colours are failsafe, while it’s smart, sharply cut lines also make it an able alternative for a blazer and worn beside a shirt – a look Jordan pulls off ably on the red carpet.